The Ebac PD200 Dehumidifier is a very high capacity unit designed for large areas and demanding conditions. This unit can be operated in a free-standing mode if required and is also configured for a ducted installation where this best meets the needs of the user. Its heavy duty performance is matched by its rugged construction yet the whole unit is contained within a remarkably small package for a dehumidifier in this class. The Ebac PD200 dehumidifier is a unit of exceptionally large capacity. At the test conditions specified by the Association of Home Appliance Manufacturers (AHAM), of 80°F and 60% relative humidity, this dehumidifier can remove 200 pints of water per day from the air. This unit is designed for more demanding conditions of extremely high relative humidity in which it can remove over 300 pints in 24 hours, a massive figure. This huge capacity, and the ability to deliver in extreme conditions is what suits this dehumidifier for some very special situations. These include swimming pools, spas and laundry rooms and its capabilities have also been used in tough industrial and commercial settings and harsh marine environments. These and other applications can make extreme demands on the fabric of a dehumidifier and the unit is mounted on a steel chassis and encased with heavy gauge steel. An epoxy powder coating is applied to the outside of the casing to provide further protection against impacts which might damage or disable a less durable machine. The inner workings of the Ebac PD200 are equally durable and engineered for heavy duty work in tough environments. This unit is equipped with an energy efficient and powerful compressor and a sophisticated multi-speed fan to allow a lower speed, quieter operation when needed. The PD200 also excels at low temperature operation, a crucial capability in some of the most demanding applications. Ice formation on the refrigeration coils is the reason that many dehumidifiers are ineffective at lower temperatures. Degraded effectiveness can begin at ambient temperatures as high as 65°F and many dehumidifiers cease to function at all at temperatures well above those encountered in many industrial and commercial locations. The PD200 is equipped with Ebac's own hot gas defrost system which actively melts the ice as it forms and allows the unit to operate down to an exceptional 33°F. It is this feature above all others which separates the "real" industrial dehumidifier from the "also-rans" and accounts for the popularity of this unit. Installation options for the Ebac PD200 are also flexible and allow for the unit to be shipped in and set up for free-standing operation when operating in a single large area or for use on a short-term basis. In many circumstances, however, a free-standing installation is less effective or inconvenient for the user. This unit can handle large areas but these may be subdivided into separate, enclosed rooms or compartments. A commercial site or a swimming pool may wish to use a dehumidifier but do so out of sight of customers and other visitors. The unit is quiet, given its power, but 73 dB is a level of noise that may be too great in some locations that need that power. In these and other circumstances the Ebac PD200 can be installed for ducted operation, enabling it to work effectively in a number of discrete spaces, and to be out of sight and earshot if required. 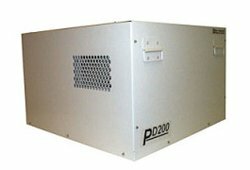 Naturally, a unit as powerful as the PD200 requires a significant amount of energy to operate. Efficient as it is it is not good business to run the machine for longer than required. The unit incorporates an adjustable humidistat with which the chosen level of relative humidity can be pre-set. Thereafter the dehumidifier operates only when needed, cycling on and off to maintain the programmed level. Not only does this maintain a constant level of humidity but by preventing unnecesaary operation of the dehumidifier it saves energy. The PD200 is also equipped for continuous drainage by means of a gravity feed. Drainage to a higher level or over a significant distance horizontally will require a separate condensate pump.